PRIME LOCATION! 3/2 Designer CBS Azalea with Florida Room, SWIM SPA, Huge BIRDCAGE and Covered Lanai, Cul De Sac Lot, PRIVACY, GOLF CART GARAGE, OPEN FLOOR PLAN, VAULTED CEILING, Open Kitchen with Gas Cooking, Breakfast Bar, Master Bedroom with laminate, En Suite with Dual Sink, Two Walk In Closets, Tile Shower, Ceiling Fan in Bath, Guest Bedroom with Murphy Bed, INSIDE LAUNDRY, Utility Sink, Huge 32X26 Birdcage with 12X15 Covered Lanai East Facing. 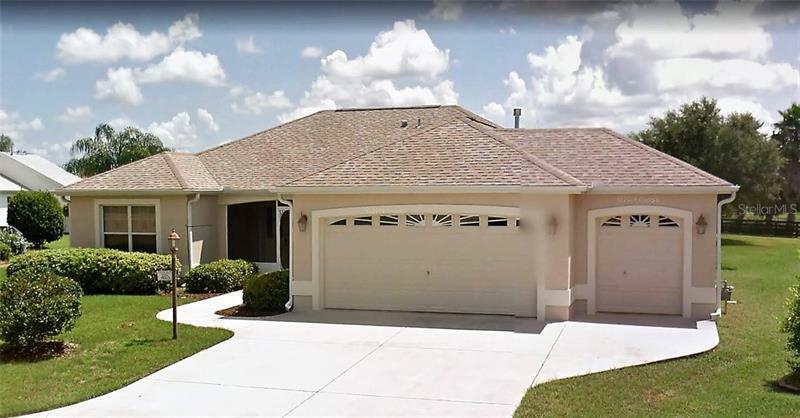 Close to Lake Sumter Landing, Lake Miona and SeaBreeze Regional Recreation Centers, Brinson Berry Dog Park, Cane Garden Championship Golf Course and Country Club, Shopping and Restaurants. PLEASE WATCH OUR VIDEO OF THIS LOVELY PROPERTY!